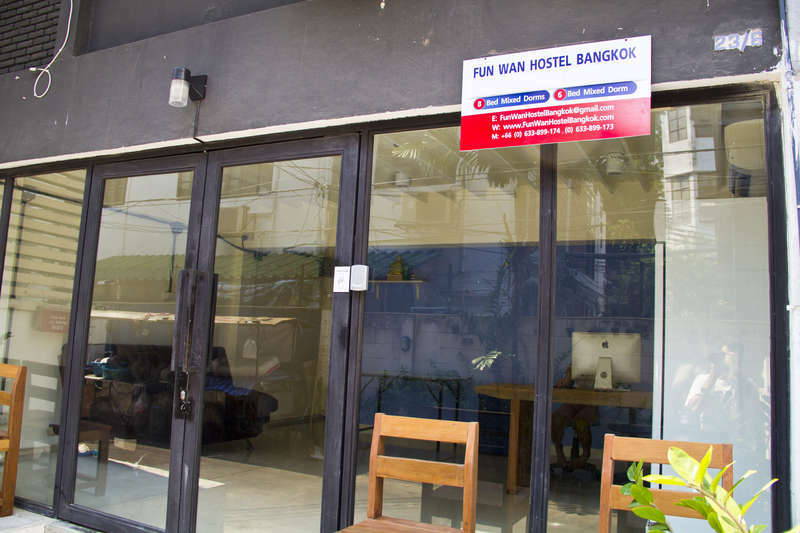 At Fun Wan Hostel BKK we have 50 beds spread across 3 floors. We offer 10 bed, 8 bed and 6 bed accommodation. Each Bed has a reading light, electrical outlet and shelf. In addition each bed has luggage storage and a locker with hangers. We have free wifi throughout the property as well as a computer lounge free of charge. Our common space includes an outdoor garden patio, games corner, reading lounge, dining area plus ping pong table and bar room serving 75 baht draft beers and 50 baht local shots. Our DIY Tour Board provides detailed information including directions, map and description of some of Bangkok's best sights, activities, eateries, shopping experiences, bars and clubs. From Nana BTS station take exit 3 and turn left onto Sukhumvit Soi 11. 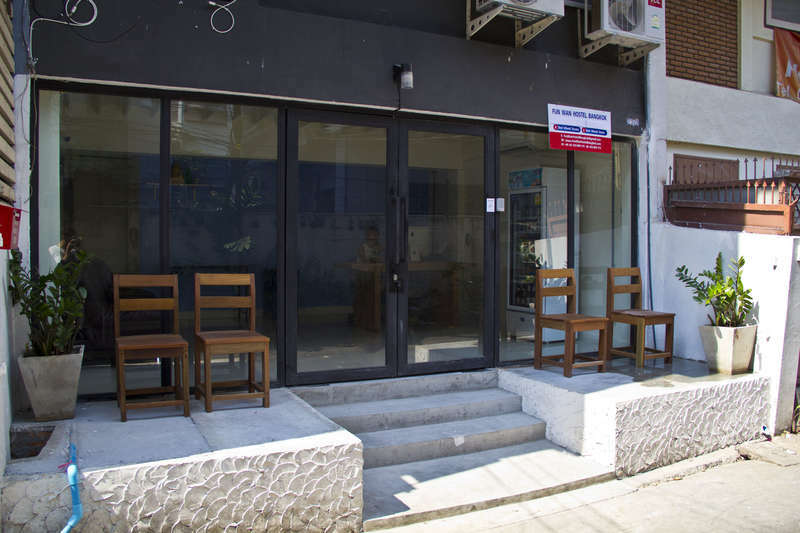 Walk 400 meters and turn left onto our small soi directly across from the President Palace Hotel just 50 meters past the Aussie Bar. Walk 50 meters and we are on the right. To reach Nana BTS from Suvarnabhumi Airport take the Airport Rail Link (ARL) to the last station, Phaya Thai. From there transfer to the Sky Train (BTS) and travel to Nana BTS Station ( only 5 stations = 10 minutes ). Alternatively you could travel on the ARL to Makkasan Station and transfer to the Subway (MRT). From there travel to Sukhumvit Station ( 1 station = 2 minutes ) and transfer to the BTS, then travel to Nana Station ( 1 station = 2 minutes ). In total either method would take 40 - 45 minutes and cost about 60 baht. From Don Muang Airport take the A1/A2 Bus to Mo Chit BTS station. From there travel to Nana BTS Station ( 10 stations = 20 minutes ). This would take around 35 minutes and cost about 75 baht. From Mo Chit Bus Terminal (Northern Bus Terminal) take a taxi or motorbike to Mo Chit BTS ( 10 minutes = 50 baht ). From there travel to Nana BTS station. Total time is 30 minutes and costs about 85 baht. From Ekkamai Bus Terminal (Eastern Bus Terminal) take BTS to Nana Station ( 4 stations = 8 minutes ). Cancellations made less than 15 days in advance will incur the cost of the first night. Cancellations made less than 7 days in advance will incur the cost of 50% of entire booking or first night booking which ever is greater. 24 Hour reception, so late check in and early check out is made simple and hassle free. 500 Baht cash security deposit will be required at check in. Any damaged, lost or stolen hostel property (linens/keys) will incur fees at check out.